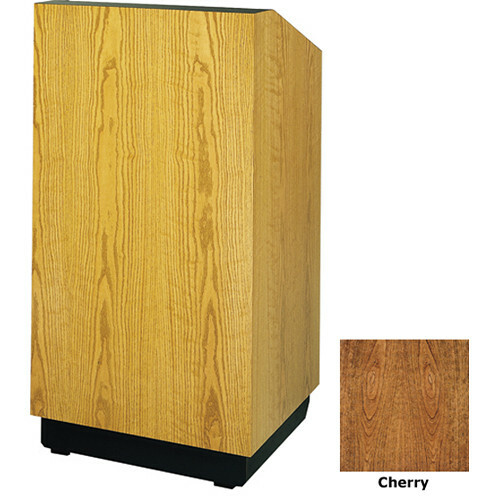 Electric Height Adjustment 47 to 55"
The Lexington 25" Floor Lectern with Electric Height Adjustment and Gooseneck Microphone from Da-Lite is a wooden unit that features a cherry laminate and built-in sound system. The unit's electrically operated height ranges from 47 to 55" to accommodate the height of the speaker. The large reading surface will hold a 3-ring binder, and a rear storage shelf provides space for collateral material. The built-in sound system features a dynamic gooseneck microphone that is powered by a 100 watt amplifier. The dashboard features on/off controls for the built-in high-intensity reading light, speaker on/off, mic volume, bass/treble controls, electric height adjustment, and the LED digital clock with countdown timer. Two non-lockable casters allow you to move the Lexington to your chosen venue.